Eunice Alyse (Schlautmann) McKain was born to Henry and Ruth (McVay) Schlautmann on January 30, 1928 in Gillette, Wyoming. At approximately one month of age, she contracted a severe illness. She survived, but was left completely deaf. At the age of 6, she began attending the Nebraska School for the Deaf in Omaha, Nebraska, as Wyoming did not have a deaf school. Eunice married the love of her life, Kelsa McKain, Jr. on May 22, 1965 at the Methodist Church in Craig, Nebraska. She and Kelsa farmed outside of Craig, and raised three kids: Minnie, Mark and Robert. In 1990, they retired, sold the farm, and moved to Fort Calhoun, Nebraska, to be closer to their church, Bethlehem Deaf Lutheran Church. After Kelsa passed away in 2001, she moved to Omaha, Nebraska to be even closer to the church. 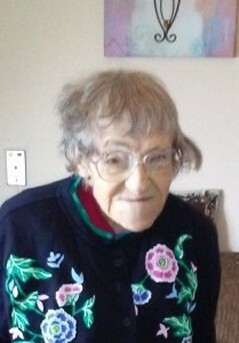 She moved to Bickford Cottage in Omaha, Nebraska in 2014, where she lived until her death. She loved to garden, sew, and bake. She always wanted to keep busy. When she moved to Bickford, she loved to help out peeling potatoes, playing bingo, crafting, and arranging flowers. She also liked it when AC/DC came on the radio. Who wouldn’t love that bass beat? She was preceded by her parents, Henry (1967) and Ruth (2001) Schlautmann, husband Kelsa (2001), and daughter Mary Angela (1968.) She is survived by her children, Minnie (Mark) Olson, Mark (Jenny) McKain, and Robert (Sherril) McKain, and grandchildren, AlyseEggers,Stephanie Eggers, William Oldson, Sean Olson, Joshua(Vanessa) McKain and Isaac McKain. Funeral Service Tuesday ( 2/5/2019) 11 AM with visitation from 10-11 AM at Roeder Mortuary, 2727 N. 108th St. Omaha, NE. Interment Tekamah Cemetery. Thanks to Roeder Mortuary, Omaha, NE and Amy Willman for the information.